A jolly Gerard Houllier held a press conference this morning to assure Aston Villa fans that he completely, like totally, knows what he’s doing. I am aware of the Aston Villa fans chanting “you don’t know what you’re doing” to me during our 1-0 defeat to Wolverhampton Wanderers this weekend. I would like to take this opportunity to remind you all that I certainly do know what I’m doing. I am paid a vast, VAST amount of money to do my job and I happen to be excellent at it. I am achieving everything that I set out to do when I took up my position here as manager – in many ways, I’m ahead of my timescale. I am confident that I will be able to achieve my goal of taking Aston Villa into the Championship within the next year. I have full backing of the excellently named Randy Lerner to do this, as he views the entire Villa “experiment” as a massive tax write-off. I fully intend to strengthen the squad with further overpriced transfers in the vein of Darren Bent during the close season, spending as much money over the asking price as need be in order to have a roster of players who are as mercenary and unmotivated as myself. I will add to this by signing overpaid, over-the-hill former superstars such as Robert Pires who have all the pace and guile of a three legged hippopotamus. 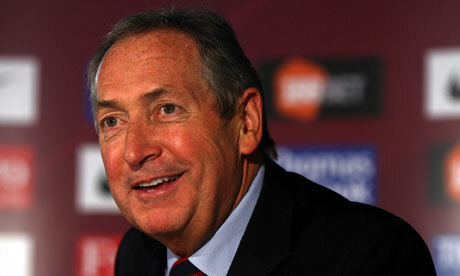 Houllier was then forced to stop talking as he laughed so hard that he started choking. When asked by the assembled media if he would be answering questions he raised his middle finger and left the room, chuckling to himself.